Dr. Carabellese is Associate Professor of Forensic Psychiatry, Dr. Catanesi is Professor of Forensic Psychiatry, and Dr. La Tegola is a Psychologist Psychotherapist, Medical School of University of Bari, Policlinico Universitario, Bari, Italy. Dr. Felthous is Professor and Director, Forensic Psychiatry Division, Department of Psychiatry and Behavioral Neuroscience, Saint Louis University School of Medicine, St. Louis, MO. Drs. Rossetto and Franconi are psychiatrists, Residenze per l'Esecuzione delle Misure di Sicurezza (REMS), Castiglione delle Stiviere, Aziende Sanitarie Locali (ASL), Castiglione delle Stiviere, Italy. Before its closure on April 1, 2015, the Castiglione delle Stiviere was the only maximum-security hospital in Italy that admitted women. In this context, the investigators examined factors related to psychopathy that were thought to be gender specific. Several prior investigations have reported a significant correlation between psychopathy and borderline personality disorder, a disorder thought to represent the phenotypical expression of psychopathy in women. The purpose of this research was to identify psychopathological and phenotypical gender-specific factors that are associated with psychopathy in women. The data appear consistent with that found in the recent international literature and also highlight the different phenotypical manifestation of psychopathy in the two genders. Whereas in males psychopathy is associated with antisocial personality disorder, in females psychopathy is associated with borderline personality disorder. Psychopathy in women has been understudied.1,2 Debated is the question of whether and to what extent psychopathy in women is phenotypically the same as that in men. A better understanding of psychopathy in women could contribute ultimately to improved preventive, treatment, and management strategies. This article begins with a concise review of the extant literature comparing psychopathy in men and women. The following section examines the developing construct of psychopathy and its measurement, in particular with the Psychopathy Check List-Revised (PCL-R).3 Next, the change in the Italian mental health system for mentally disordered criminal offenders and the unique population of mentally disordered female offenders that constituted the group selected for the study are described. To our knowledge, this is the only study of psychopathy in females in Italy. It is also one of the very few studies in which the PCL-R was used to compare psychopathy in male and female subjects. Ambivalence about the application of psychopathy to women is discussed by Nicholls and Petrila.11 Some question the usefulness of the construct in women because of psychological gender differences. Others assume that the construct, as researched in men, will apply equally to women. Nicholls and colleagues1 concluded in their review that psychopathy is manifested differently in women. They also concluded that “little consensus exists regarding the etiology, expression, assessment, prevention, management and treatment of psychopathy in females” (Ref. 1, p 361). The importance of recognizing psychopathy in women10 and the need for more research on female psychopathy1 are well recognized and addressed by the present study. Psychopathic women tend to be less aggressive than men, with less tendency to repeat criminal conduct. They show more self-directed violence and a greater risk of suicide. They are more seductively manipulative,14 emotionally unstable, anxious, and prone to develop posttraumatic stress disorder (PTSD) and drug addiction. According to Dolan and Voellm,28 some of the most typical traits of psychopathy may have different underlying motivational factors in men and women. Promiscuity in female psychopaths may reflect the desire to gain financial or social benefits. Moreover, social norms could influence the evaluation of certain psychopathic characteristics differently in men and women. Manipulative women more often tend to flirt, whereas manipulative men are more likely to run scams and commit fraud. In women, the tendency to run away and to exhibit self-injurious behavior and manipulation characterize their impulsiveness and behavioral problems. The interpersonal symptoms in women are usually not characterized by superficial charm and grandiosity, as is the case with men. In both genders, there is a clear connection between psychopathy and abuse of alcohol and drugs,10,12 although this correlation is even stronger in psychopathic women.29,30 Several studies have reported a significant correlation, apparent more often in women than in men, between psychopathy and a histrionic pattern,1 but especially between psychopathy and borderline personality disorder (BPD).1,11,31,32 It has been suggested that BPD in women represents the phenotypical expression of psychopathy.10 In particular, F2, which is a measure of interpersonal and affective abnormality in psychopathy, such as the tendency to be manipulative and lack of empathy,33 shows a closer correlation with34,–,36 and higher total scores on PCL-R and BPD in women. From the second half of the 19th century onward, the treatment of offenders with mental illness who were at risk of recidivism (dangerous to the society) in Italy was entrusted to hospitals for criminal offenders (manicomi giudiziali; judicial asylums). One century later, these asylums were transformed into actual forensic high-security psychiatric hospitals, known as judicial psychiatric hospitals (ospedali psichiatrici giudiziari; OPGs). The OPGs were directly managed by the Italian Ministry of Justice. They maintained their cultural and therapeutic profiles, even after the Reform Law on Assistance to the Mentally Ill (Law No. 833) was enacted in 1978, mandating the closure of the general psychiatric hospitals (ospedali psichiatrici; OPs) in Italy. The OPG of Castiglione delle Stiviere in northern Italy was the only facility that admitted women. All women who committed a crime in Italy and were at risk of recidivism were remanded to the OPG of Castiglione. Originating in the unique OPG hospital of Castiglione, the idea of research on possible gender-specific factors related to psychopathy, a psychopathological variable related to antisocial behavior39 and criminal recidivism,3 was developed and carried out. Three models for PCL-R are based on factor-analytic studies using the two-factor model47: Factor 1 (interpersonal-affective) and Factor 2 (antisocial-criminal lifestyle); the three-factor model48: Factor 1 (arrogant and deceitful interpersonal style), Factor 2 (deficient affective experience), and Factor 3 (impulsive and irresponsible behavioral style); a four-factor model3: Factor 1 (interpersonal), Factor 2 (affective), Factor 3 (lifestyle), and Factor 4 (antisocial). The two factor model was used in this study. The items were divided into Factor 1 (F1), which assesses core personality features, and Factor 2 (F2), which assesses antisocial behavior and poor impulse control. F1 reflects interpersonal and affective items and appears to be stable over time.49 The interpersonal facet includes: superficiality, grandiosity, lying, and manipulation, whereas the affective facet includes lack of guilt, shallow affect, lack of empathy, and lack of responsibility for one's actions. According to one definition of psychopathy,56 the psychopathic person has a total lack of empathy and a sadomasochistic relationship style based on power rather than on emotional bonding. He is unable to identify with others and is completely indifferent to the potentially dangerous results of his actions. This study was conducted in the OPG of Castiglione delle Stiviere from August 1, 2012, through February 1, 2013. At the time of the study, the population of the OPG was composed of a male section with 230 men and a female section with 86 women. The main purpose of the study was to identify psychopathological and phenotypical gender-specific factors that are related to psychopathy. This research was conducted in compliance with the rules established by the ethics committee for the facility, which approved the study in advance. The patients enlisted were informed of the purpose of the research and participated after written informed consent was obtained. All women who provided their consent (i.e., all 86 hospitalized women), underwent a clinical evaluation that included a comprehensive clinical history. Data were available for only 66 of them. After a period of observation, we administered to the entire sample the Structured Clinical Interview for DSM-5 (SCID) I and II interviews and other tests: Minnesota Multiphasic Personality Inventory (MMPI)-2, Millon Clinical Multiaxial Inventory (MCMI)-III, and the Repeatable Battery for the Assessment of Neuropsychological Status (RBANS). This battery of tests allowed the investigators to diagnose 33 patients with personality disorders, 31 of whom were categorized as Cluster B and 2 as Cluster A. To highlight the gender characteristics that related to psychopathy, we compared this population with a group of men who were hospitalized during the same period. This group of male subjects of equal sample size was controlled for diagnosis, age, and legal status. Diagnoses were established with the same clinical and historical assessment that was used for the women. Thus, a group of 33 male subjects was selected who had personality disorders, including 29 categorized as Cluster B and 4 as Cluster A. The total sample consisted of 66 patients (33 women and 33 men). To achieve the goal, a clinical and historical assessment was conducted to investigate age, gender, marital status, education, personal and family psychiatric history, legal status (not guilty by reason of insanity (NGRI) or partially guilty by reason of insanity), type of crime (property versus person), and pharmacotherapy. To evaluate the index of psychopathy, the Psychopathy Checklist-Revised,47 recently validated in Italy,46 was used. Extant literature supports the utility of the PCL-R in assessing psychopathy in female offenders.2 For this research a score ≥25 was considered indicative of psychopathy,45 which is the cutoff that is generally recognized in Europe. The diagnosis of psychopathy was made in 30.1 percent of the sample (11 men and 10 women) with an average score on the PCL-R of 28.5 for the women and 26.5 for the men. In 85 percent of the psychopathic men, the diagnosis of ASPD prevailed; in the women, BDP (80%) was the most common personality disorder (Figure 1). 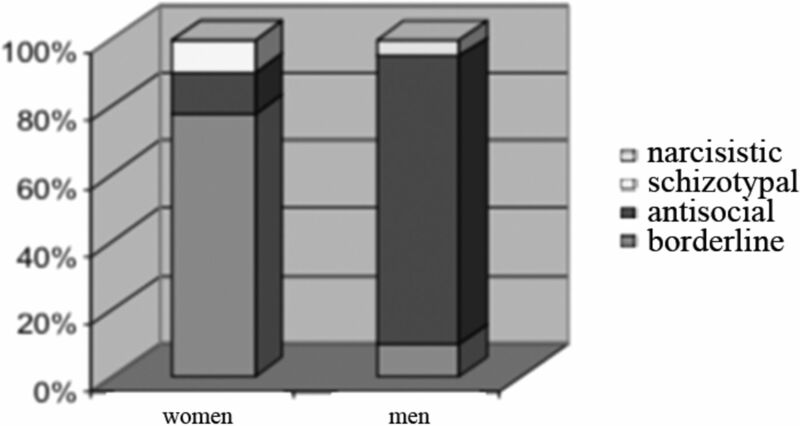 The distribution of personality disorders among psychopathic women and men. In the psychopathic women (n = 33) BPD was the most common personality disorder, while in the psychopathic men (n = 33), the most common personality disorder was the ASPD. These data appear consistent with results found in the recent international literature and, in addition, highlight the different phenotypical manifestations of psychopathy in the two genders.2,64 Male and female samples were each dichotomized based on the presence or absence of psychopathy. The four subgroups so obtained (psychopathic men, psychopathic women, nonpsychopathic men, and nonpsychopathic women) were compared according to the following variables: F1 scores, F2 scores, types of criminal offenses (against person/against property), type of violent behavior (self-aggressive behavior/aggressive behavior against others), substance abuse (present or absent), legal status (total absence of responsibility or diminished responsibility), types of medication prescribed (antipsychotics, mood stabilizers), psychiatric history before having committed the crime and whether they had a history of mental health treatment before committing the index offense. 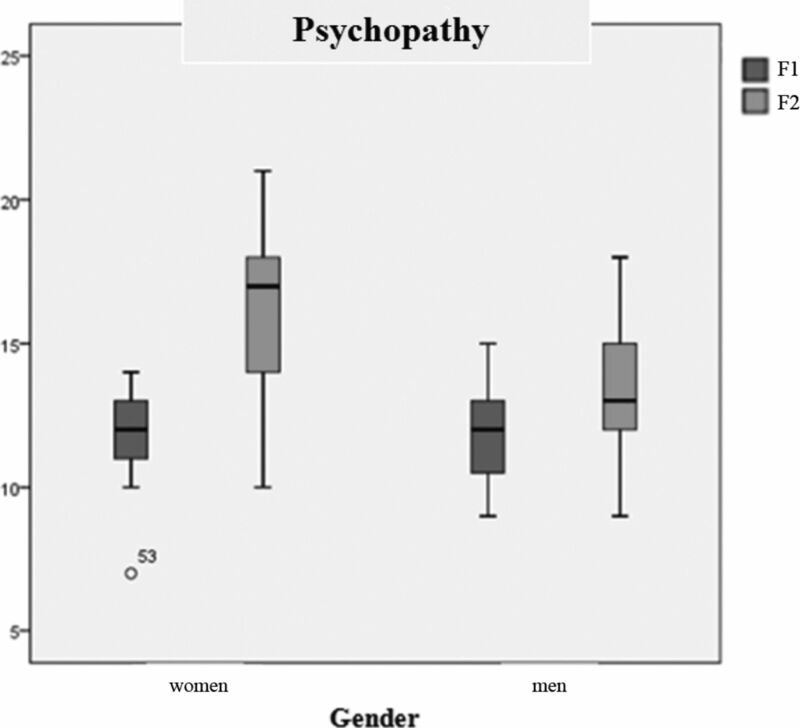 In men and women with psychopathy, specific gender differences were not statistically significant, although the women with psychopathy showed an average F2 score that was higher than that of the male subjects (Figure 2). Psychopathy. In men and women with psychopathy, specific gender differences were not statistically significant (11 men and 10 women). Regarding the type of crime committed, a significantly larger number of men in the psychopathic group had committed crimes against the person (p = .024) than the group of psychopathic women. In the latter, there was instead a slight predominance of property crimes compared with crimes against the person (Table 1). The study groups showed no significant differences with regard to substance abuse; however, psychopathic men and women showed a higher percentage of substance abuse than for nonpsychopathic men and women (75% versus 57.8%). The literature shows a positive correlation between secondary psychopathy (high F2 scores) and substance abuse.1,47,65,66 Regarding legal status and pharmacotherapy, there were no significant differences in the psychopathic groups. Finally, taking psychiatric histories into consideration, no significant gender differences were identified between the groups. Apparently, psychopathic women more often have a positive psychiatric history (77.8% versus 60.9%) compared with nonpsychopathic women. In psychopathic men, this difference was not observed. The BPD diagnosis was found in 80 percent of the female sample, with PCL-R score ≥ 25. Most in the male sample had antisocial personality disorder. These findings are consistent with those in the international literature36 and suggest that BPD and psychopathy, as measured by current instruments, overlap in women. This result may reflect gender-differentiated phenotypical expressions of similar dispositional vulnerabilities. With regard to co-occurring substance abuse, no significant differences were found between the men and women, with or without psychopathy. This study has the following limitations: first, the sample sizes were small and therefore did not provide optimal power for statistical analysis. Moreover, ratings were conducted by five different raters in the same setting. Second, this was a study of a national sample of women defined as dangerous to society for psychiatric reasons by the Italian Penal Code, who were admitted to a high-security hospital. However, the comparison group was a sample of men from northwest Italy, who nonetheless were comparable in sample size, age, diagnosis, and legal status. We cannot rule out some gender bias in court adjudication of the male and female groups. This study does not control for criminality with a comparison group of nonoffending females, a consideration for future study.